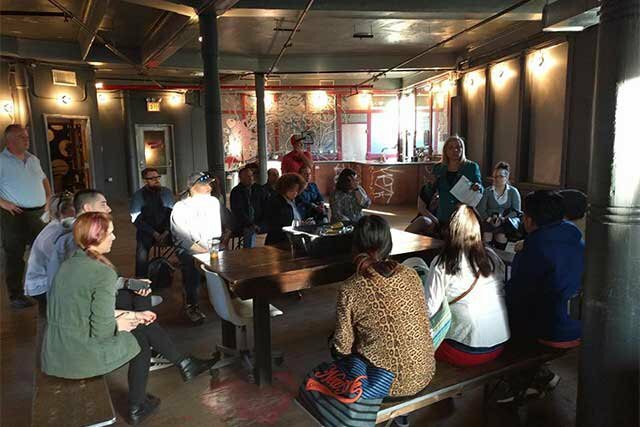 Community members meet with Bushwick Assemblywoman Maritza Davila at Market Hotel. Bushwick community members who occupy twenty-six apartments on the triangular block adjacent to the Myrtle Ave-Broadway station on the J, M and Z trains and who discovered last week that M train work will necessitate that they leave their homes for a definite 6-10 months and possibly much longer met Wednesday night to share their experiences and consider plans of action. 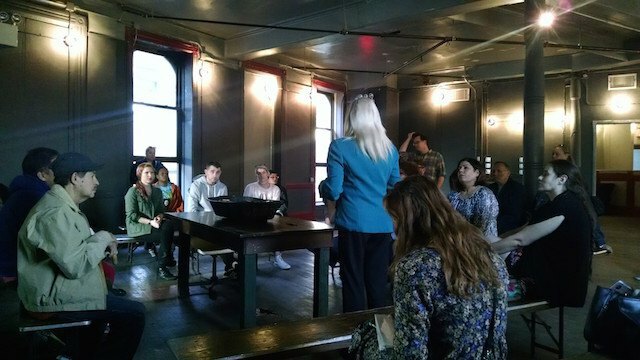 The organizing meeting was held at the Market Hotel, the the venue above Mr. Kiwi's, which is right between the straight line of the J train and the curvy anomaly on the M train known as the Myrtle Viaduct (this building is not currently among the buildings, though the venue's founding organizer Todd Patrick tells Bushwick Daily that he wants to support his neighbors however he can). Photo by Todd Patrick and used with permission by Bushwick Daily. Also in attendance was Bushwick Assemblywoman Maritza Davila, who ran through all of the information she had received from the MTA up until this point for her worried constituents. She reassured residents that when an assistant commissioner from the MTA told her two weeks ago about the potential for relocating some residents near the M train track, she said no and suggested a meeting be held to discuss alternatives. There was no meeting. Instead, some affected residents received notice by letter, and others found out from a Newsday reporter who contacted them requesting their comments about the relocation. The official letter residents receives begins with this statement: "We are writing to provide you with initial information about how the project will impact your property and those who live there." 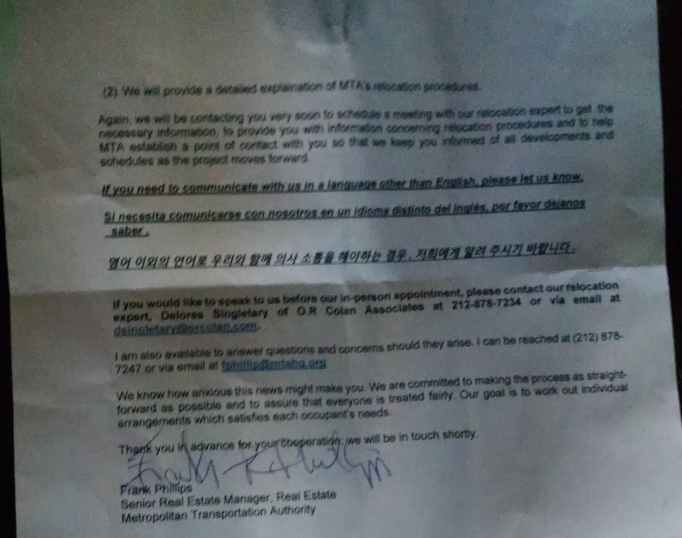 Two paragraphs later, the MTA's initial piece of communication with affected residents turns into an impersonal order to evacuate: "Because the viaduct is so close to the houses on Ditmars Street, residents in those houses, including your houses, will need to be relocated for a period of time while demolition and new construction work is underway." 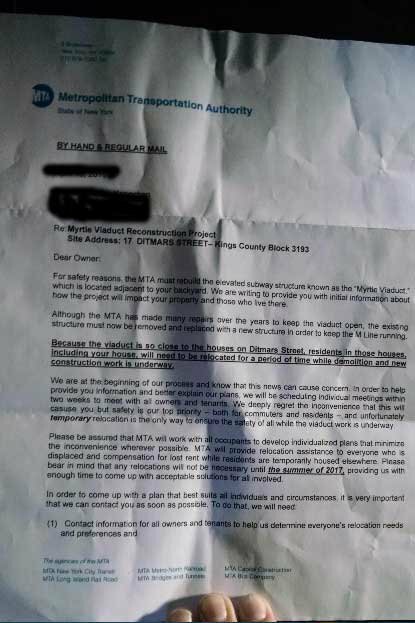 The first side of the letter residents received. The second side of the letter residents received. Among Ditmars street residents, some of whom have lived in their homes for 50 years, are those who tell Bushwick Daily that the impersonal treatment they have received thus far (one resident told her neighbors that an MTA official who visited her home slipped her a note advising her to get a lawyer) has not given them any reason to trust that their best interests will be considered the MTA's plans progress.